REY DUAL por HA DUAL CD PLAYER Importado. ABQM Awards 2017 - Reprodutor Laço Pé. Pai de campeões em várias modalidades como Apartação, Rédeas, Laço, Laço Comprido, Ranch Sorting, tendo seus filhos 946 pts ABQM, entre eles: DUAL LITTLE CHAT, Res Campeão Copa Campeões ABQM Laço Cabeça Am; SISSY PLAYER DAN, Campeã Nacional ABQM Laço Comprido Tec Ab Jr; Campeã Copa Campeões ABQM Laço Comprido Tec Am Pr; DOC JAY DUAL, Res Campeão Congresso ABQM Expointer Laço Comprido Armada Ab; NOBLE CD GUN, Campeão Congresso ABQM Laço Dupla Am Light; PEPTOBOONICE, Campeão Nacional ABQM Ranch Sorting Ab; DUAL RED PLAYER, Campeão Copa Campeões ABQM Laço Pé Am Pr, entre outros. DESIRES LITTLE REX (c. by Smart Little Lena). $287,519: NCHA Open Futurity Reserve Champion; NCHA Super Stakes Open Classic Reserve Champion; Brazos Bash Non-Pro Derby Reserve Champion; finalist in the Abilene Spectacular Open Classic, Tunica 4-Year-Old Open Futurity, etc. THUNDERCAT (c. by High Brow Cat). $187,001: finalist in the NCHA Open Futurity; 7th, NCHA Open Super Stakes; NCHA Limited Non-Pro Derby Champion, finalist Non-Pro; Breeders Inv. Open Derby Reserve Champion; Cotton Stakes Open Derby Reserve Champion, etc. DESIRES KATRINA (f. by High Brow Cat). $135,433: 4th, NCHA Open Derby; 7th, NCHA Open Classic/Challenge; 3rd, Breeders Inv. Open Derby; 3rd, Tunica & Abilene Spectacular Open Classics; finalist in theNCHANon-Pro Super Stakes; Music City Classic Champion. DESIRES REY (f. by Dual Rey). $37,714: Tunica Summer Open Derby Co- Reserve Champion; finalist in the Memphis 4-Year-Old Open Futurity, NCHA Amateur Classic/Challenge, Breeders Inv. $10,000 Limited Open Derby. DESIRABLE AND CATTY (f. by High Brow Cat). $28,339: Royal Flush Open Classic Co-Champion, 4th Non-Pro; 3rd, NCHA Western Nationals Open; NCHA Area 6 Open and $10,000 Novice Champion. Desires Smart Lena (f. by Smart Little Lena). Dam of-- DESIRES BLUE TRINITY. $129,318: finalist in the NCHA Open Futurity; Abilene Spectacular Open Derby Champion; Cotton Open Derby Co-Reserve Champion; split 5th, NCHA Derby; 9th, 2012 NCHA Super Stakes Open Classic. Importado. ABQM Awards 2017 - Reprodutor Laço Pé. Pai de campeões em várias modalidades como Apartação, Rédeas, Laço, Laço Comprido, Ranch Sorting, tendo seus filhos 946 pts ABQM, entre eles: DUAL LITTLE CHAT, Res Campeão Copa Campeões ABQM Laço Cabeça Am; SISSY PLAYER DAN, Campeã Nacional ABQM Laço Comprido Tec Ab Jr; Campeã Copa Campeões ABQM Laço Comprido Tec Am Pr; DOC JAY DUAL, Res Campeão Congresso ABQM Expointer Laço Comprido Armada Ab; NOBLE CD GUN, Campeão Congresso ABQM Laço Dupla Am Light; PEPTOBOONICE, Campeão Nacional ABQM Ranch Sorting Ab; DUAL RED PLAYER, Campeão Copa Campeões ABQM Laço Pé Am Pr, entre outros. NITROS REAL DEAL, U$ 35.765,00; 8o.L West Tx Futurity Open; DUAL SHOT DOC, U$ 31.730,00, Finalista NRHA Futurity Open; PINK NITRO GLYCERINE, U$ 31.648,00, 6ºL NRCHA Non-Pro Futurity. No Brasil já produziu animais premiados em várias modalidades de trabalho, entre eles: NITRO BEAVER, Res Campeão Nacional ABQM 2016 Laço Comprido Ab; 3o.L Campeonato Nacional ABQM 2016 Laço Comprido Am; TYNA MOON DOC, Res Campeã Derby ABQM 2017 Laço Comprido Tec Am; Res Campeã Nacional ABQM 2016 Laço Comprido Tec Ab Jr; quite dual, Campeão Potro Futuro AGQM 2016 Laço Pé Ab; FOREST DOC, Res Campeã Potro Fututri Sul Matogrossense Ranch Sorting Ab, etc..
- MISS SPOOKY REYBECCA (Spooky And Smart) R$ 18.750,00 e 25 pts ANCA / 21 pts ABQM. Campeã Super Stakes ANCA Ab. - CD REY DUAL (Puro CD) R$ 25.271,00 e 34 pts ANCA. Res Campeão Potro do Futuro ABTCA Ab. - DOX BELLA (Spooky And Smart) R$ 24.781,95 e 16,5 pts ANCA. Res Campeã Potro do Futuro ABTCA Ab; 4o.L Potro Futuro ANCA Ab Ltda. - REY BLUE BECCA (Blue Boonsmal) R$ 9.926,46 e 13,5 pts ANCA. 3o.L Potro do Futuro ABTCA Ab. - CD BOB REY (Puro CD) R$ 6.455,00 e 11 pts ANCA. Campeão Super Stakes ANCA Am. - REY HEY (Puro CD) R$ 11.863,00 e 39 pts ANCA / 15 pts ABQM. Res Campeão Potro do Futuro ABQM Ab. - REYBECCA CAT HEY (Metallic Cat) R$ 11.863,49 e 14 pts ANCA. Campeã Potro do Futuro ANCA Ab Ltda. - PRINCESS REYBECCA (Spooky And Smart) 3o.L Campeonato Nacional ABQM Ranch Sorting Ab. - CD SUPER REY (Puro Cd) R$ 10.379,00 e 19 pts ANCA. - CD DUAL REY (Puro CD) R$ 2.612,05 ANCA. 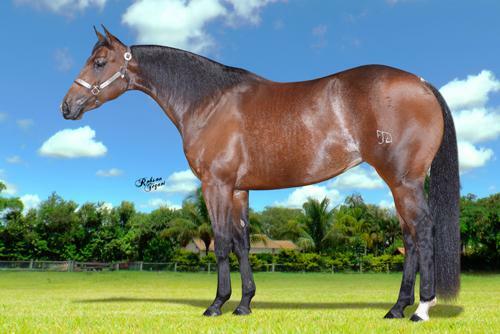 - REYBECCA CAT (Hydrive Cat) 3o.L Campeonato Nacional ANCA Am Jr.
- AGF REYBECCA STAR (Play Like Star) 4o.L Congresso ABQM Ranch Sorting Am, 4o.L Campeonato Nacional ABQM Ranch Sorting Am Ms.
-- REYZIN ( High Brow CD) U$ 351.136,00. NCHA Non Pro Horse Of The Year. Res Campeã Non Pro Derby; Res Campeã Breeders Inv Open Derby. - PUDDEN POP (D) (Pop A Top Pep) U$ 20.839,00. Finalista NCHA Amateur Classic/Challenge e El Cid Open Futurity. .
- HEY REYBECCA (Dual Rey) R$ 23.288,00 / 105 pts ANCA / 30 pts ABQM. Campea Super Stakes Classic ANCA Ab e NP; Campea Nacional ABQM Jv; Campeã Congresso ABQM. Seus filhos somam R$ 106.752,00 E 167 pts ANCA / 97 pts ABQM.